A ninja’s life is ever-perilous and uncertain - you never know what type of combat scenario you may face, day-to-day. 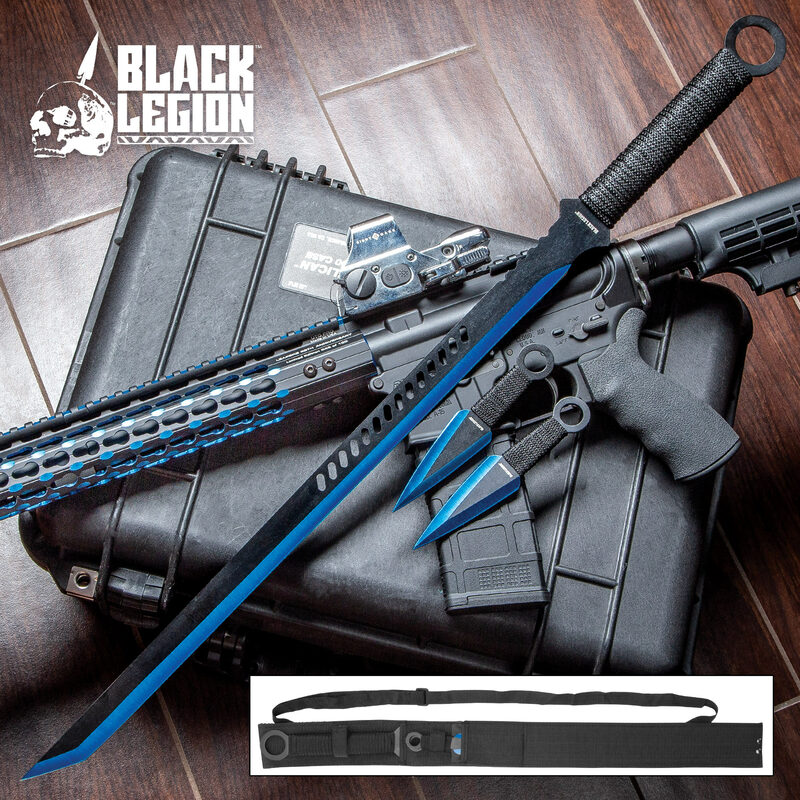 From close-up sword duels to launching distance projectiles, the versatile Black Legion 3-Piece Blue Sword and Throwing Knife Set has all the weapons you need in a compact, easy-to-carry package. The fierce-looking sword boasts a razor-sharp 20 3/4” blue satin stainless steel blade with robust tanto point and elegant highlights, like a slanted elliptical punch-out design along the fuller. 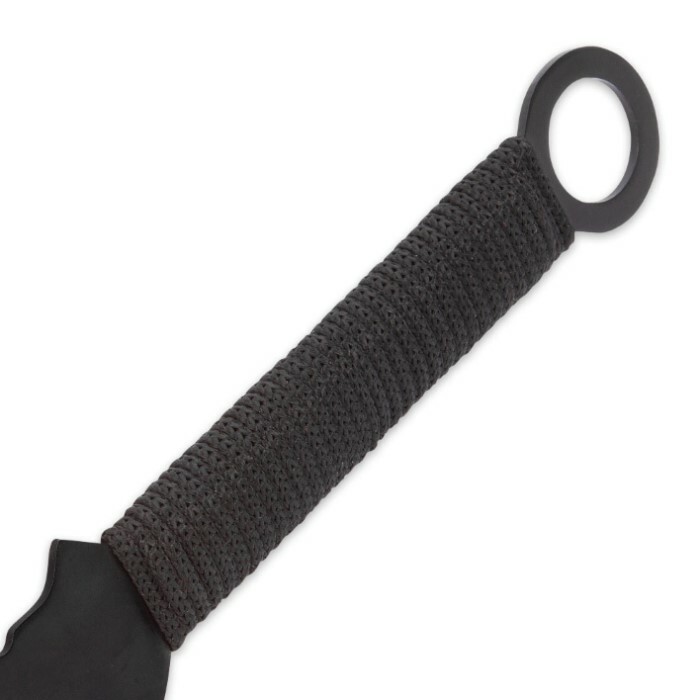 Its black rope-wrapped handle is a no-slip pleasure to wield, even in trying battle situations. The handle is crowned with a distinctive steel ring pommel. This 28”-overall beauty is a menace in tight quarters, but, like all swords, it won’t protect you from enemies posted yards away. Enter the set’s discreet – yet plenty potent – throwing knives. Each of the two throwers feature stinging 3 1/2" spear point blades. 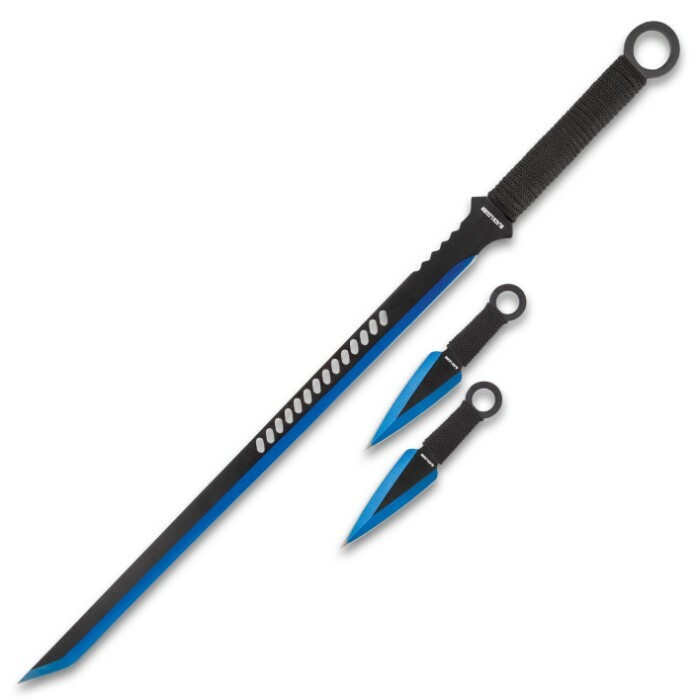 As with the sword, the blades are corrosion-resistant blue satin stainless steel, and the handles mimic the sword’s in miniature. The deadly darts’ steel ring pommels are handy for holding and casting gracefully from one’s fingertips. Both throwing knives are 6” overall. 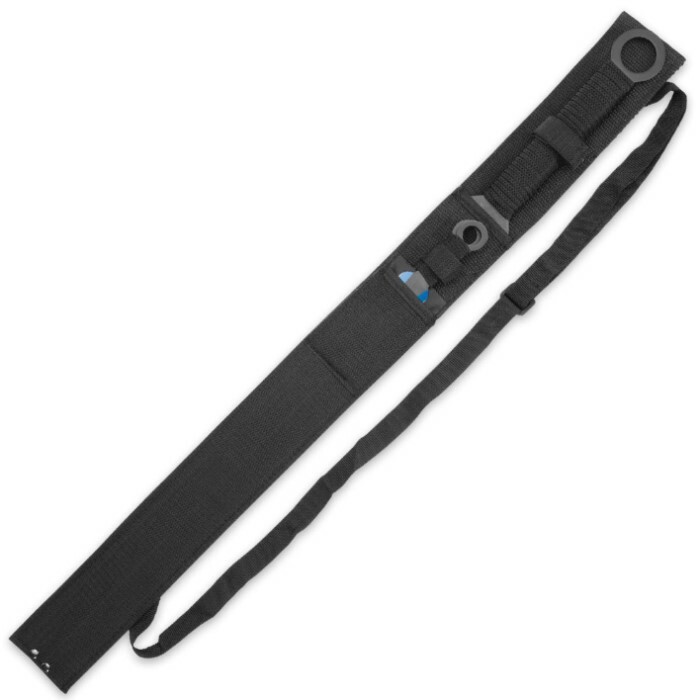 The entire set is protected with its included multipocketed nylon sheath, which includes a strap for added portability and ease-of-carry. Latter-day ninjas, martial arts weapon specialists, and anyone who needs a versatile self-defense option, don’t overlook the Black Legion 3-piece Blue Sword and Throwing Knife Set. It may just save your life, no matter how your foes attack. Best of all, no other weapon packs this many uses into such an affordable package. Even among more expensive blades, this set is sure to be your go-to defense tool, no matter the danger. So I received this for my bday, and I'm impressed. The points are all very sharp, and the sword is very nice. The only negative thing is that the knives were a little scratched. The throwing knives are so-so,but the Blue Sword is good stuff. I'd recommend it to anyone. Mine came in today, as far as 20 dollar swords go it’s pretty great. Love this little sword. Solid. Sharp. Light. Straight. Gonna wrap the handle with electrical tape to keep the cord wrapping in place. Thanks BudK. Black Legion rules! This is a great sword. It's the same size as advertised and the tip is incredibly sharp. The edge could use some sharpening but I can do that. It's heavy enough to smash a fence board no problem though. The sheath on the other hand isn't too good. It's kind of hard to put the blade back in and the strap that holds the sword in frayed off the snap so it doesn't work. Overall this is a pretty great set.